Maplevale Manor, a colonial estate resting on 14 private acres, will be offered at a luxury no reserve absolute auction by Supreme Auctions on November 5th. Working in cooperation with Holly Ritchie of Keller Williams Chervenic Realty, the highest bidder, regardless of price, will become the new owner of this magnificent property. Preview estate and sign up for Alerts for this October 27th Auction. 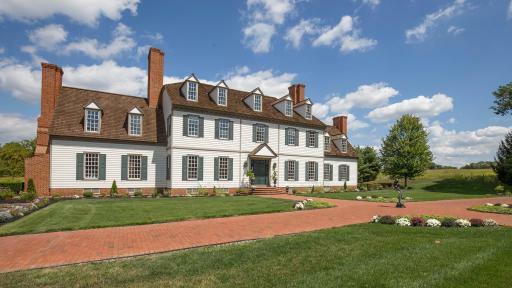 Inspired by the Peyton Randolph home in Williamsburg, Virginia, no expense was spared to recreate elegance and refinement at its best with historical accuracy, while offering all the modern amenities of the 21st century. No detail was overlooked; light switches have been cleverly hidden in door and window frames and a three-story elevator is disguised behind a traditional door panel. True to homes of the era, it features a stunning hand-carved staircase and includes secret passageways and rooms that await discovery. The kitchen is a work of art, showcasing exposed wood beams, custom cabinetry disguising top-of-the-line appliances and a huge red-brick fireplace. The home also features a unique wet bar, guest house, traditional library, and more. Barrel-vaulted ceilings, a four-car garage that looks just like a carriage house, and heated red brick steps and pathways make this home both luxurious and comfortable. With a well-stocked, 2 acre private lake, pristinely manicured gardens and red brick paved pathways, the grounds are breathtaking. Surrounded by boxwood and hardwood trees, with no close neighbors, the property offers an idyllic, private retreat. While, Canfield offers all the benefits of living in a small, friendly town; shopping and world-class entertainment in larger Youngstown are just a 20-minute drive away. With Cleveland and Pittsburgh within an hour and a half in either direction, the home offers easy access to these two major cities. With Lebron James spearheading Cleveland’s revitalization, the city offers one of the best symphony orchestras in the world, the Rock and Roll Hall of Fame and is corporate headquarters to companies like NACCO Industries and Sherwin-Williams. Pittsburgh is home to Fortune 500 companies, the Pittsburgh Steelers, and the University of Pittsburgh Medical Center. Maplevale Manor will be sold at a luxury absolute no reserve auction on November 5th, 2016. Interested parties can contact Supreme Auctions directly at (866) 929-2243 or visit www.supreme-auctions.com for more information.